Andalucia non-standard Spanish-suited playing cards with full colour paintings on all cards by Rafael Rodriguez Hernandez and published by Ediciones Baja Andalucia, Sevilla, c.1980. The four Aces have the title “Andalucia” inside a green and white banderole, which are the colours of the Andalusian flag and the subject of the Andalusian anthem. Continuing the theme of Andalusian nationalism, the cup suit symbols are sherry glasses and the clubs are olive branches. 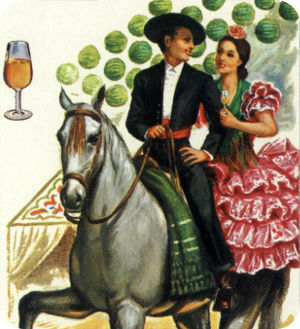 The court cards show sherry pouring; bullfighting regalia and riding horseback; costumed ladies and musicians, all of which are typical of Southern Spain. The region has a rich culture and a strong cultural identity. Many cultural phenomena that are seen internationally as distinctively Spanish are largely or entirely Andalusian in origin. These include flamenco, bullfighting, and certain Moorish-influenced architectural styles. The cards are manufactured by Heraclio Fournier S.A., Vitoria (Spain). 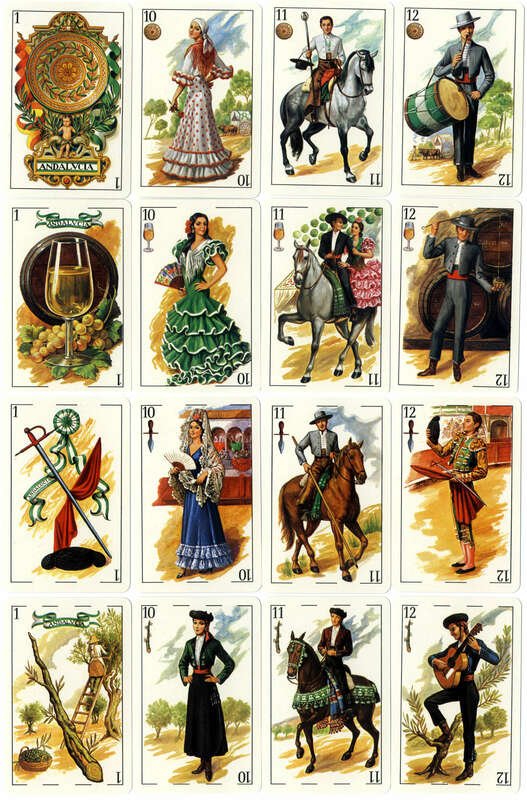 Above: 'Andalucia' non-standard Spanish-suited playing cards created by Rafael Rodriguez Hernandez and published by Ediciones Baja Andalucia, Sevilla, c.1980. 40 cards in box, manufactured by Heraclio Fournier S.A., Vitoria (Spain). The reverse has a gold design on green background.